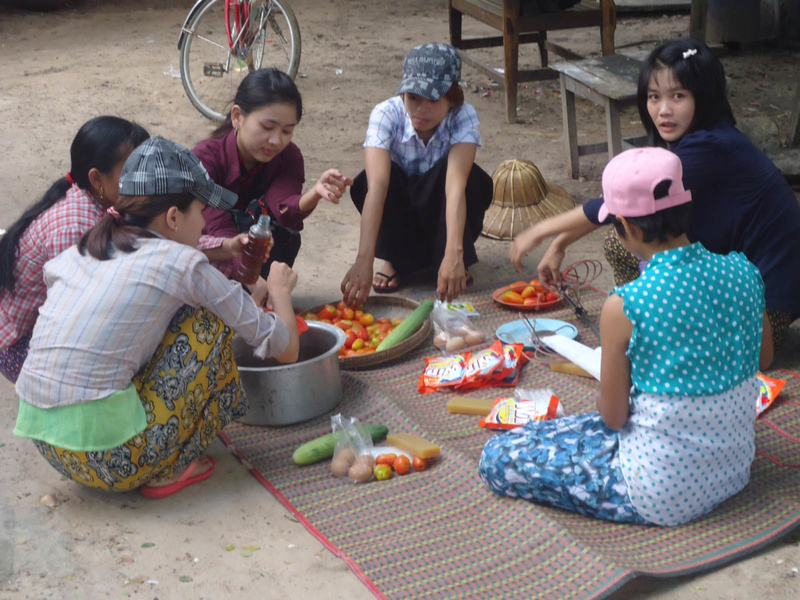 Ei Ma village in Kyonpyaw township is home to 227 people (60% of whom are women) living in 79 households. Most villagers are smallholder farmers and sometimes work as casual laborers on the fields. ECLOF started serving the village in 2013. ECLOF clients gather weekly in the village community building for group meetings, training and loan transactions. Before getting access to a loan, each client participates in 5 training modules given by ECLOF staff over a period of 2-5 weeks. Avoiding vices like drinking, gambling etc. During the training period, clients are required to save small weekly amounts with ECLOF as a reserve fund. Only then are they allowed to take out a loan. ECLOF offers agricultural loans tailored to specific crops like cassava, banana, rice or gardening, and “social loans” to cover health and education needs.The liquidity provided by ECLOF’s loans has allowed farmers to stop relying on middlemen for expensive advance credit: the traders used to buy a basket of their rice for 500 kyat right after harvesting. Now farmers can sell the rice later for 1,000 kyat. Villagers say they appreciate ECLOF’s fair interest rate and repayment schedules that suit their income stream. Today, ECLOF serves 9 groups, reaching 56 households. This approach has changed the attitude to savings in the village: while previously people didn’t have the habit of saving money, now over USD 800 have been deposited with ECLOF by the villagers and are available to them when needed. The National Electrification Plan of Myanmar’s government requires a financial contribution by each household before a village is connected to the grid. This means a village needs to raise collective household savings. Poorer households are at the risk of being left out. Since ECLOF entered Ei Ma village in 2013, villagers have increased their earnings from agriculture and business and save money regularly. This allowed them to make their contribution—so that in 2015 the village was connected to the grid. This has greatly improved the quality of life, raised business productivity and allowed students to study at night, even when solar lanterns cannot be charged during the rainy season. Until recently, the village was accessible only by a footpath. To build a gravel road, the local government required villagers to contribute labor and cash to road construction. Because of increased incomes and savings, villagers were able to make their contributions—and now the village has a gravel road apt for motorcycles. This has opened up new markets for villagers to sell their produce and supply inputs.